Making these cinnamon and nutmeg scented garlands kicked off the the holidays for me, and officially put Christmas in the house. I festooned the fireplace with them and gave some to friends. They are made of salt dough and not edible; but they are sweet just the same. 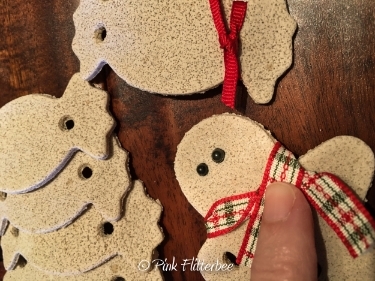 Make your favorite Christmas shapes, bake them up and string them on twine or ribbon. They are easy to make and put together. It's a great activity to do with kids. I made my dough with minimum kneading and used Morton Coarse Kosher Salt so the crystals would show. 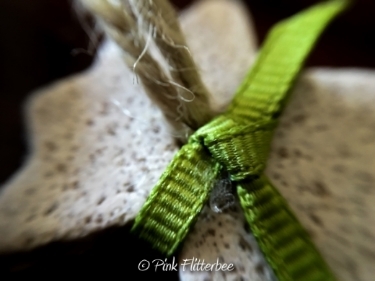 You can use twine, or ribbon to string them. It is futile to resist! Bees nearly faint over cinnamon and nutmeg scented Christmas garland. Twine or ribbon to thread shapes onto, 60"
In a large bowl mix salt and flour together and gradually add in water and mix well. *Add optional food coloring to the water before you add it to flour and salt. Knead for 4-5 minutes. I wanted my dough to show the salt crystals so I didn’t knead it more than 3-4 minutes. If you want your dough to be smooth, just knead it longer. Roll out dough on a sprinkling of flour. Roll to about 1/8” thickness and cut your shapes. Cut the holes for the string/ribbon with a straw. Place on a parchment covered cookie sheet and bake at 300 for 45 to 60 minutes. Keep an eye on them. The baking time will depend on your oven and the thickness of your shapes. Cool on a rack. When completely cooled you can paint your shapes and seal with varnish. I left mine purely naked. With two batches I made about 15 garlands each with 8 shapes per garland on 60” twine and or ribbon. Add a loop to each end. How many shapes you will get depends on how thick you cut your dough, and the size of your shapes. I found the little clothespins online and thought they were a nice addition to the garland.